The slow collapse of the City Council Planning and Land Use Management (PLUM) committee into the arms of the sign companies continues. If you are ready to be shocked at what LA might look like in the near future, read the latest Planning Department report to the committee, which was just posted this week. The PLUM committee asked the Planning Dept. to report on how the city might permit the installation of digital billboards outside of sign districts. The planners seem to have written this report reluctantly, because they referred in the text to their previous opposition to digital signs outside sign districts. But still, they followed orders and drew up various plans to allow both off-site and on-site digital signs in ways that should arouse the opposition of anyone who cares about our visual environment. Instead of installing off-site digital signs only in areas zoned Regional Commercial, the proposal calls for allowing them in areas zoned “Regional Center Commercial, Regional Commercial, General, or Highway Oriented Commercial and Zoned Commercial.” Which means, in practical terms, any zoning with the word “commercial” in it. As for allowing on-site digital signs, the least permissive option suggests creation of a new tier of sign districts: “A Tier 3 type Sign District would allow a wider variety of businesses to establish on-site digital signs while retaining a Citywide prohibition on digital signs.” So we might have both a citywide prohibition of digital signs and a wide variety of on-site digital signs, which sounds Orwellian on its face. And Tier 3 is the most restrictive option; neither of the other two options proposed provides for any kind of public hearing. Throughout, there are exceptions allowed for digital signs at gas stations and theaters, almost no matter where they are located. When we add this memo to PLUM’s previous consideration of allowing digital billboards on city property, we see that the committee is taking the sign ordinance in another irresponsible direction. We are headed for digital signs on nearly any busy street in Los Angeles. We don’t yet know what will be the terms of the ordinance that PLUM will send to the full council. But in its lust for more campaign contributions from sign companies, the committee seems to be renouncing any meaningful consideration of traffic safety or aesthetics. Billboard Relocation: Latest Plan to Unleash Digital Billboards in L.A. 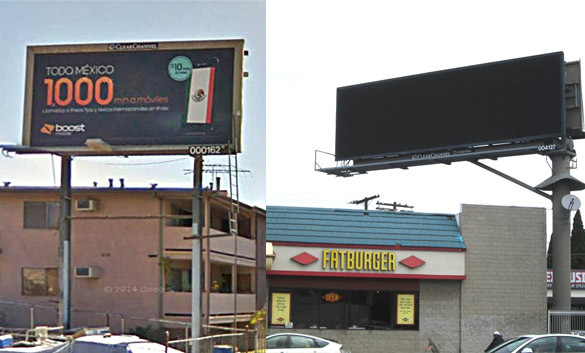 Under latest plan, Clear Channel could take down three billboards like the one on the left in East L.A. and turn on the digital billboard, right, in West L.A. The slow-moving but relentless push for more digital billboards on L.A.’s commercial streets got a boost last week with the unveiling of a detailed plan for allowing the now-prohibited signs. Presented to the City Council’s Planning and Land Use Management (PLUM) committee, the plan would require billboard companies to make payments to the city and remove a certain number of existing billboards in exchange for the right to put up new signs of the highly lucrative digital variety. The committee directed city agencies to develop a legal framework to implement the digital billboard plan, even though the City Planning Commission (CPC) last year approved a new citywide sign ordinance that restricts the brightly-lit signs with rapidly changing ads to sign districts in a limited number of high-intensity commercial areas. That action would put those signs off-limits in more than 80 per cent of the city’s commercial zones. With certain exceptions, new billboards and alterations to existing billboards have been banned in L.A. since 2002 and digital billboards have been explicitly prohibited since 2009. However, state law allows cities to enter into relocation agreements with billboard companies, which means that a billboard can be moved from one location to another without running afoul of billboard bans such as L.A.’s. This law, intended to relieve cities from the burden of paying large amounts in compensation if a billboard has to be removed from private property for a street widening or other public works project, has been advocated by billboard giant Clear Channel as a mechanism for not only putting up new digital billboards, but turning on many of the 99 digital billboards that went dark by court order three years ago. This, of course, directly contradicts what billboard company representatives and pro-digital billboard politicians have said for several years, which is that communities should be able to choose whether or not they want the signs on their commercial streets. 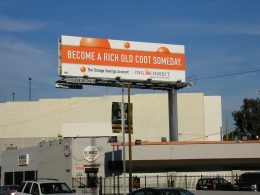 If people in North Hollywood or East L.A. see the billboards as bringing benefits to their community, the argument went, they should have them; if people in Silverlake or Westwood see them as a detriment, they should be able to say no. Be that as it may, here are the details of the CLA’s plan: A billboard company wishing to put up a new digital billboard could choose to remove existing billboards at a ratio ranging from 2:1 to 9:1, based on square footage of sign face. 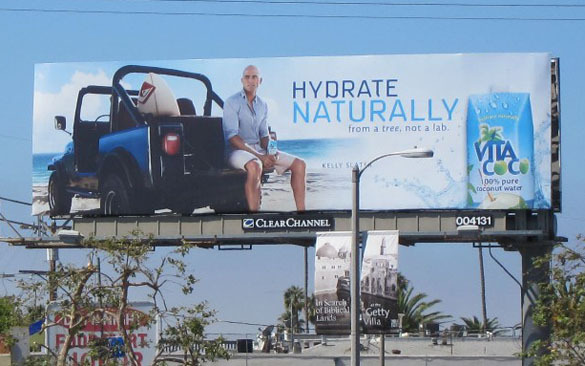 A standard full-sized billboard is 672 sq. ft., so two of those or some other number of signs adding up to 1,300-plus square feet would have to removed. If a billboard company chose the 2:1 ratio, it would have to pay the city an annual fee of $250,000, but if it took down existing billboards at higher ratios the required fee would incrementally decrease, up to the 9:1 ratio, which would not trigger any fee payment. The plan also recommends that companies putting up new digital billboards provide “community benefits” to offset the negative impacts of the new signage. These include streetscape improvements, public art programs, and funding for transit-related services, among others. There are some proposed restrictions on where the new digital billboards could be put. For example, in public parks, along designated scenic highways, in historic preservation zones, and areas zoned neighborhood or limited commercial. The plan also proposes a limit on the light cast by the billboards, although the method of measurement is widely regarded as an inaccurate reflection of the brightness of the signs that employ thousand of LED lights, and many cities, including L.A., have begun using a newer, more accurate method that measures the light at its source. After listening to these details, along with a related report by the City Administrative Officer (CAO) and comment from members of the public, PLUM committee chairman Jose Huizar closed the discussion by directing the city agencies, with the assistance of the city planning department and City Attorney’s office, to return with additional details needed to implement the plan, which would require ultimate approval by the full City Council. Despite the fact that the issue has drawn heated public debate, and the plan represents the first detailed step in the direction of allowing new digital members on most commercial streets, not a single member of the committee other than Huizar had any comment or question for the city officials presenting the reports. Before moving on to other items on the committee’s agenda, Huizar also got in a swipe at the City Planning Commission, which he has accused in the past of overstepping its bounds by making changes to the sign ordinance sent to it by the committee. Those changes mean that the City Council will need a supermajority, or 10 votes, to overrule the commission’s approval of an ordinance that restricts new digital signs to sign districts. Huizar also raised an issue that has been alluded to but not explicitly discussed by committee members in the past, which is the idea that the less affluent City Council districts have borne the brunt of billboard blight in the past, and are therefore particularly deserving of the relief promised by the takedown provisions of the CLA’s digital billboard plan. The councilman, whose district encompasses most of downtown and the majority Latino communities of East L.A. and Boyle Heights, pointed to statistics in the CAO report showing that his district ranks first among the city’s 15 council districts in number of billboards. The district, along with two South L.A. districts, have 36% of the total billboards in the city, Huizar said. And while the City Planning Commission’s restriction of new digital billboards to sign districts also includes a requirement that any new signs be offset by the takedown of existing billboards, Huizar said that this would not result in a significant reduction of billboards in those districts. But are Huizar’s East L.A. district and the two predominately Latino and African American districts in South L.A. he cited really disproportionately blighted by billboards? According to city records, Huizar’s district has 772 billboard faces, which is the highest of any of the 15 council districts. 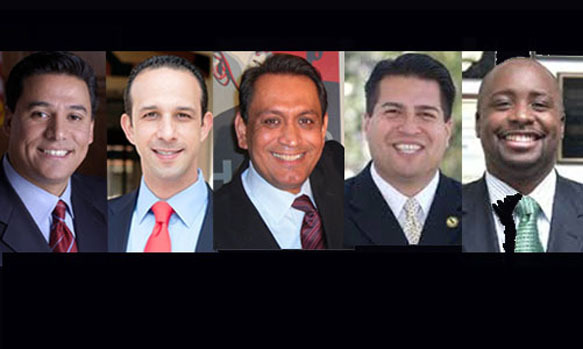 Council districts 8 and 9, represented by council members Marqueece Harris-Dawson and Curren Price, respectively, who also happen to be members of the PLUM committee, each have 719 billboard faces, ranking them second to Huizar’s district. However, if those districts are ranked by total square footage of billboard faces, Huizar’s district ranks 7th, and the other two 11th and 13th. In fact, the district ranked first on this scale, councilman Paul Koretz’s predominately westside district, has 279,000 sq. ft., compared to 165,000 sq. ft. in Huizar’s district and only 97,000 sq. ft. in Price’s district. Which means that Koretz’s more affluent district has fewer billboard structures than those other districts, but the billboards have significantly larger faces and therefore display larger, more prominent advertisements. Thus, the argument over which districts are disproportionately blighted by billboards turns on the question of what is the major source of the blight, the billboard’s structure or the advertising displayed on the face. The council districts ranked 2nd, 3rd, and 4th in terms of square footage of billboard space each have more than 200,000 sq. ft. Along with Kortez’s district, those districts represented by Mike Bonin, David Ryu, and Mitch O’Farrell also happen to be the ones in which Clear Channel and Outfront Media put up all but a handful of 101 digital billboards beginning in 2007 and ending with a moratorium at the end of 2008. Those districts not only had more full-sized billboards to convert to digital but are among the most affluent in the city and therefore more attractive to advertisers paying premium rates for the 8-second spots on the signs. It’s therefore no mystery why Koretz, Bonin, and Ryu have publicly announced their opposition to allowing digital billboards anywhere outside sign districts, as per the City Planning Commission action. Councilman Paul Krekorian has also publicly opposed plans to allow new digital billboards outside sign districts on private property, although none of the 101 signs went up in his San Fernando Valley district. O’Farrell hasn’t taken as definite a stand as his four colleagues, but has told constituents that he was happy with the planning commission’s action. If the plan presented this week to allow digital billboards beyond those limited sign districts is eventually approved, Clear Channel could turn on most of the 84 billboards it put up in 2007-2008. Likewise, Outfront Media. And the city’s third major billboard company, Lamar Advertising, which owns some 3,000 small billboards in mostly lower-income neighborhoods, could erect new digital billboards on commercial thoroughfares in areas with the more affluent consumers valued by advertisers. 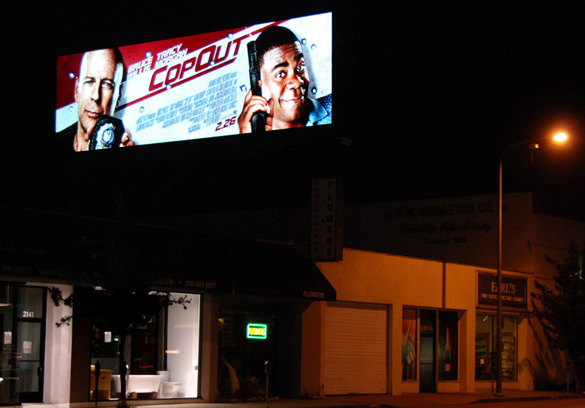 For example, the plan would allow Clear Channel to turn on a now-dark digital billboard on Santa Monica Blvd. in West L.A. in exchange for removing two or three old, rundown billboards in council district 8 in south L.A. and paying the city an annual fee of $250,000. That might seem a great deal for Harris-Dawson, who represents that district and has complained of billboard blight there, but what of people in the residential neighborhood adjacent to that Santa Monica Blvd. billboard who repeatedly complained of constantly changing light cast into their homes and brilliantly lit ads for products and services looming beyond their roofs in the night sky. A fourth member of the PLUM committee, Gil Cedillo, whose district west and north of downtown includes some of the city’s poorest areas, could also benefit from the removal of old, blighted billboards, especially since Clear Channel and company are not likely to look at most of the district as fertile ground for new digital billboards. The fifth member, Mitchell Englander, represents a much more affluent district in the northwest San Fernando Valley, but the predominately residential district has by far the fewest number of billboards in the city and probably wouldn’t be a major target for companies wanting to put up new digital signs. As mentioned above, the plan would require votes from 10 of the 15 city council members since it conflicts with the ordinance approved by the planning commission. If council members Bonin, Koretz, Ryu, and Krekorian maintain their current stands, and are joined by O’Farrell, they could block that action since one council seat is currently vacant. However, that vacancy will be filled in the upcoming city election and a new council member will be seated on July 1 or next year. There are some other hurdles as well. A Clear Channel representative has written a letter to the committee criticizing the takedown ratios as too high, and arguing that instead of a set annual fee the companies and city should negotiate a fee for each relocation agreement. Regency Advertising and Summit Media, two of the city’s small billboard companies, have also argued for lower takedown ratios and fees on the grounds that the proposed plan would shut them out of the process. And City Attorney Mike Feuer, who unsuccessfully sponsored a statewide moratorium on digital billboards when he was a state assembly member, has not weighed in on the possible legal ramifications of the billboard relocation scheme. Feuer has already poured cold water on one of the PLUM committee’s earlier proposals, which was to grant “amnesty” to all unpermitted and non-compliant billboards in the city. To read the CLA and CAO reports in the city’s council files, click here. Coming Attractions: New Digital Billboards on L.A. City Streets? Will this digital billboard re-appear? In this location, or elsewhere? Photo from 2010. New digital billboards are going to start popping up along L.A.’s streets and freeways, probably sooner than later. The only questions are exactly where these brightly-lighted signs with rapidly-changing ads will appear, and how many will ultimately brighten the landscape with their shiny sales pitches to motorists, cyclists, and pedestrians on those congested thoroughfares. This Clear Channel digital billboard was shut off by court order in 2013. The political debate over allowing new digital billboards in L.A. has little to do with issues like traffic safety, light pollution and energy use. In fact, it’s not even a debate in the classic sense but can be characterized as an interplay of two powerful desires. 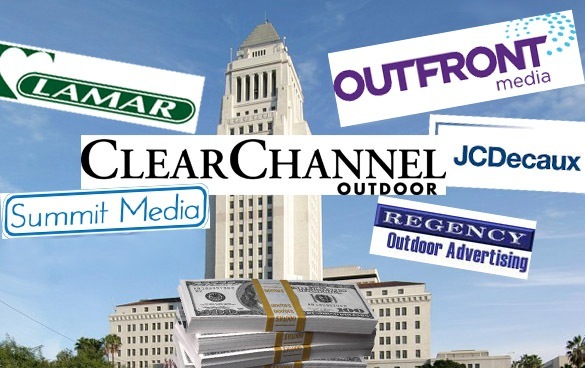 Clear Channel and other big billboard companies badly want to put up the electronic signs on city streets and freeways and the City Council desperately wants to find new sources of revenue. Despite the unanimous opposition of the City Planning Commission, an L.A. City Council committee is pushing ahead with a plan that could ultimately result in new digital billboards going up in a wide area of the city. Last fall, the planning commission approved a new citywide sign ordinance that restricts the brightly-lighted signs with rapidly changing ads to special sign districts in a limited number of high-intensity commercial areas. At a meeting this week, the council’s Planning and Land Use Management (PLUM) committee turned a cold shoulder to that idea, and directed three city departments to jointly develop detailed proposals for allowing the currently prohibited signs outside those restricted areas, either on city-owned property or on both public and private property. Committee chairman Jose Huizar said these proposals need to include revenue sharing to the city, funding for sign law enforcement, and the removal of billboards blighting various neighborhoods. This is an about-face from 2015, when Huizar was running for re-election and his answer to a candidates’s questionnaire seemed to support restricting digital billboards to sign districts. Committee members Felipe Fuentes and Marqueece Harris-Dawson both complained that the City Planning Commission’s restriction of new digital billboards to sign districts wouldn’t result in the removal of billboard blight from their districts, in the east San Fernando Valley and South L.A., respectively. The ordinance approved by the planning commission requires that new digital billboards in sign districts be offset by the takedown of existing billboards in surrounding communities at a square footage ratio of ten to one. 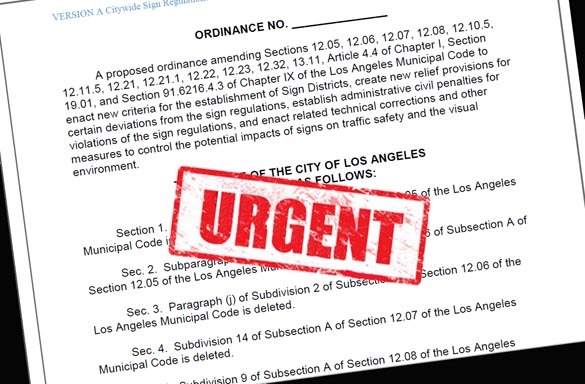 In that ordinance, sign districts are only allowed in 22 areas of the city zoned regional center or regional commercial, such as downtown, Universal City, Warner Center, LAX, Century City, and the Coliseum/USC area, among others. There are no sign district-eligible areas in Fuentes’s district, but there are two in an adjacent district, in Van Nuys and Panorama City. The ordinance approved by the planning commission doesn’t limit the required billboard takedown to a specific distance from a sign district, and commissioners discussed expanding the takedown area to the entire city, although that provision wasn’t included in the final version of the ordinance. At the committee meeting, Harris-Dawson called many of the existing billboards in his district “a big, giant sore thumb.” That district includes a sizeable sign district-eligible area in the Baldwin Hills/Crenshaw Plaza commercial area, and under the planning commission’s ordinance a new full-size digital billboard could be put up there only if 10 full-size billboards or a larger number of smaller billboards were first removed in the surrounding community. Neither Fuentes or Harris-Dawson mentioned the fact that a city survey has shown that more than a hundred billboards in those councilmembers’ districts have either been erected or altered without required permits. In a letter to the PLUM committee last year, City Attorney Mike Feuer said his office was ready to help take enforcement action against many billboards across the city that fall into that category, but to date the committee members haven’t responded to that offer. There was little discussion by committee members about the city’s prospect of getting revenue from new digital billboards, although that’s been a central point of a vigorous lobbying campaign by a coalition of billboard companies that want to put up an untold number of new digital billboards along freeways and city streets. That coalition includes the three largest billboard operators in the city—Clear Channel, Outfront Media, and Lamar Advertising. Councilmember Paul Krekorian has put forth a proposal to allow new digital billboards on city-owned property in exchange for a share of revenue and the takedown a certain number of existing billboards, but the councilmember’s proposal leaves details such as the exact number of new billboards and their locations to be worked out. Councilman Gil Cedillo, a PLUM committee member, floated a proposal two years ago to allow new digital billboards in any commercial area through a conditional use permit process. And Clear Channel, which owns 84 digital billboards that have been shut off by court order since 2013, has pushed for city permission to relocate some of those billboards, ostensibly to locations where they aren’t as likely to generate complaints from nearby residential neighborhoods. All those proposals got a firm thumbs down from the planning commission, whose members agreed that any digital signs should be restricted to sign districts where their size, brightness, and hours of operation could be strictly regulated to minimize potential traffic hazards, light pollution, and adverse affects on surrounding residential neighborhoods.. The major billboard companies have long opposed these restrictions, and while none have publicly commented on Krekorian’s proposal, it’s unlikely that they are happy with the prospect of being allowed new digital billboards only on a limited number of properties owned by the city. In fact, Lamar Advertising sued the city in 2013 for the right to put up 45 new digital billboards in specific locations in a wide area of the city. The Louisiana-based company won a favorable ruling from a Los Angeles Superior Court judge, but the California Appeals Court overturned that ruling earlier this year, upholding the city’s right to ban those signs. Another 2014 proposal, by committee member Mitchell Englander, called for granting “amnesty” to all unpermitted and out-of-compliance billboards in the city, but there was no mention of it at this week’s meeting. The planning commission emphatically rejected the idea, calling instead for the city to begin enforcing the law against all illegal billboards. Neither Englander nor Cedillo commented on the planning commission’s action during this week’s PLUM committee meeting. Both councilmembers, as well as Huizar, have received significant financial support from billboard companies in their past election campaigns. And Englander has gotten a number of campaign contributions from billboard companies and their lobbyists in his current bid for election in November to the L.A. County Board of Supervisors. The billboard industry’s PR apparatus generates a number of questionable claims on behalf of digital billboards. They support local businesses, they advance non-profit causes, they provide critical emergency information, they help catch dangerous criminals and find missing children. But the most dubious may be that digital billboards are no more distracting than static signs and therefore pose no hazard to motorists on freeways and busy commercial streets. 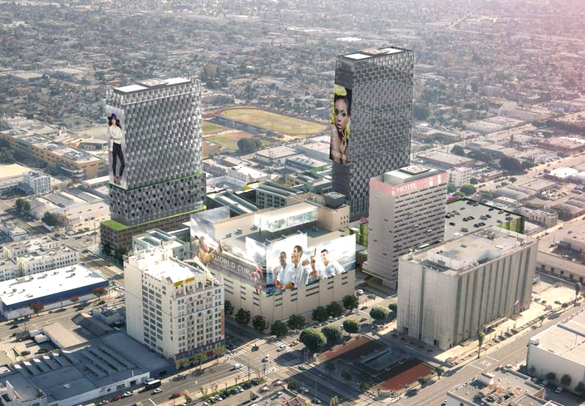 The Reef: Digital Signage Spectacle Coming to South L.A? Architect’s rendering of The Reef project. Not all proposed signage is shown. Sign, Sign, everywhere a sign….that lyric from a popular 1971 rock song could be a tagline for the latest developer’s megadream, a two-square block extravaganza of entertainment, shopping, and housing in a heretofore fallow—development-wise—area south of downtown L.A.
A City Council committee has proposed “amnesty” for billboards like this double-faced Clear Channel sign, which has a permit for only one face, according to city records. The hearts of anti-billboard folk had to be warmed by last month’s Los Angeles City Planning Commission meeting, where commissioners cast a jaundiced eye on proposals to grant amnesty to illegal billboards, allow new digital billboards outside sign districts, and exempt more than a dozen “applied-for” sign districts from the new, stricter regulations in the pending citywide sign ordinance. People who have followed the twist and turns of the city’s long-running billboard wars may be surprised to learn that the Los Angeles City Planning Commission is tentatively scheduled to discuss a new citywide sign ordinance at its meeting on Sept. 24. Why surprised? Because all the way back in 2009 the commission held three lengthy public hearings on that very same ordinance before approving it and sending it on to the City Council. Billboard companies seeking new laws allowing more digital billboards and legalizing unpermitted and out-of-compliance signs spent $1.1 million lobbying city council members and other officials in the first six months of 2015, according to City Ethics Commission reports.